Summer is here and it’s time for outdoor living – hooray! Do you have a favorite outdoor living area, deck or spot in the sun at your home? Or are you dreaming of creating one? In this article, we’ll take a look at some of the best outdoor living ideas and trends to inspire and help you create your own. Indoor-style is moving outside as new durable outdoor fabrics and materials make furnishings more suitable for outdoors. Create a comfortable setting area with personal style using stylish new waterproof furniture and area rugs made from recycled plastics. Add in some bright colored ceramic tables and accent pillows for a pop of color and decorative outdoor light fixtures and lanterns to create an inviting glow in the evenings. 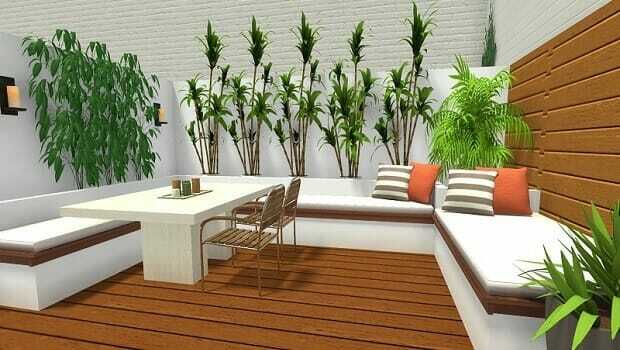 Whether you’re outdoor area is large or small you can give it better definition and make it more functional by creating outdoor rooms. Think of dividing your garden or yard into functional spaces – just as you would inside your home. Create places for eating, lounging, playing and bathing. Outdoor kitchens are all the rage and why not?! Who wants to be stuck in a hot kitchen on a beautiful evening, when you could be cooking and eating, al fresco. You can create an outdoor kitchen by simply adding some counter-style prep space around an outdoor grille. If you have an available water connection, consider adding a prep sink or an ice maker. If you have an electrical connection, go one step further and add an undercounter refrigerator, refrigerated drawers or a beverage cooler. However, if you love the idea of an outdoor kitchen, but you don’t have the room or utilities to create one, then consider adding a large sliding door or pass thru window to open up your kitchen to your garden. And, one of our favorite outdoor living ideas, is to add a counter and some stools to create an instant meal prep, serving and bar area. As water shortages threatening more areas, it’s time to re-think your landscape. Take an outdoor living idea from hotels and restaurants and think hardscape with green accents. Combine pavers, stones, and decking to create a functional multi-use landscape. Add some terracing and height difference to add variety and interest. Plant the border with tall leafy plants for softness and color. Then feature sculptural plants with interesting shapes and textures in planters and pots. Two outdoor living ideas that are catching on fast are fire and water features. Water reflects the sky and adds calming ambient white noise and cooling humidity. While fire warms us and draws us together. Both of these elements promote meditation. A water feature can be as large as a pool or as simple as a recirculating fountain. Outdoor fireplaces and fire pits are all the rage (and they’re fun for toasting marshmallows) but a bowl of candles or a grouping of lanterns can create the same effect. 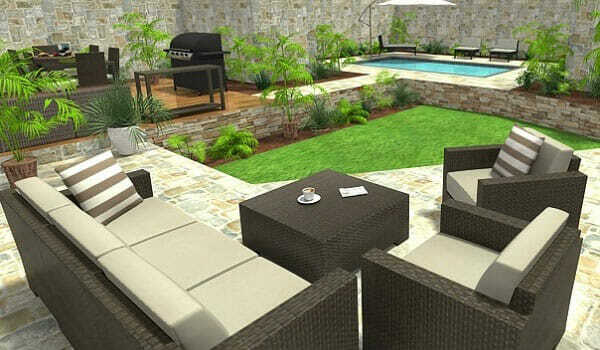 Add the elements to your outdoor living areas to promote balance and relaxation. Create a semi-enclosed outdoor living area with a pergola or pavilion. Beat the heat by creating a shady spot with all the amenities of being indoors. Adding a pavilion or pergola has become much easier as many outdoor furnishing companies now sell pergola and pavilion kits too. Whether it houses an area for lounging, cooking or dining, a pergola or pavilion creates a perfect place to enjoy the outdoors. The backyard shed is no longer just for extra storage. With cool-prefabs and a little clever designing, you can create an awesome backyard hideaway. A backyard shed can house all sorts of activities from a home office or art studio to game rooms and lounges, even spa-like bathrooms with a shower, sauna or tub with a garden view. Extend your shed with a deck, terrace or pergola area and make it part of your outdoor living areas. Whether for work or play, escape or entertainment, a backyard shed can provide a useful and versatile outdoor living extension to your home. RoomSketcher Home Designer is an easy-to-use floor plan and home design tool that you can use to plan and visualize your outdoor living areas. 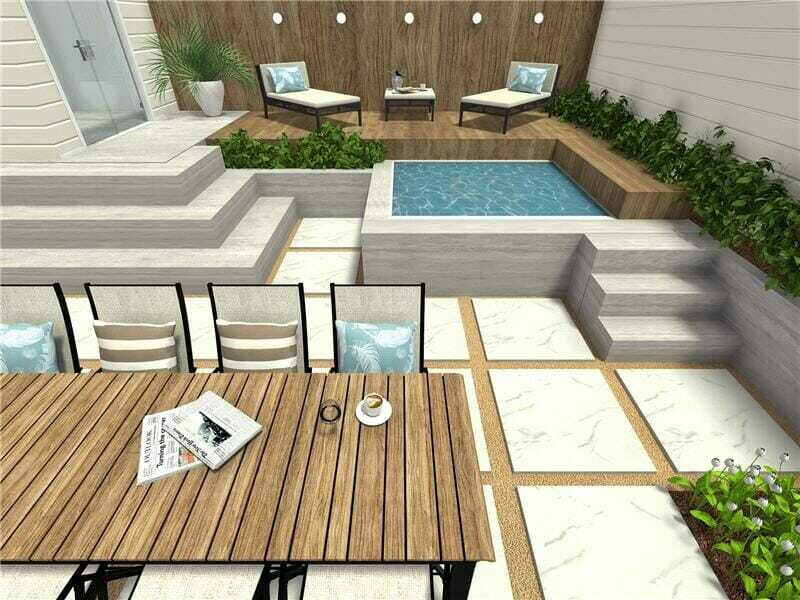 Create floor plans, garden layouts, decks, terraces and more. Design outdoor kitchens, pergolas, pavilions, sheds… you name it! Just draw your floor plan, furnish and decorate it, and see your design in 3D – it’s that easy! For more outdoor living area ideas, tips and inspiration – check out the recommended posts below.